I’ve been a Mets fan for 49 years. (I feel old just typing that.) I’ve seen scores of players come and go. Some made their mark, while most didn’t. David Wright obviously did—not only in the record books but in the hearts of baseball fans, Mets fans, and his fellow players. In an interview with SNY’s Steve Gelbs today, David was asked if he’s at peace with himself, having worked so hard to get back to the field, even if only to play one last game before he retires. Physically unable to continue performing at a major league baseball level, Wright said that he’s at peace with the effort he made to return but not at peace with the result—the career he loved was taken from him because of a stupid injury. It was not his choice to stop playing. I can relate to that. My former career was ripped from me as well, against my wishes. As some of you know, I earned my bachelor’s degree in English and loved writing—but I was told the only thing I could do with an English degree was teach. As flawed as that advice now seems, I did not question it at the time. However, a separate incident made that point moot: a migraine sufferer as a teen, I went for my first chiropractic treatments at age 14 because traditional medicine had failed me. Medication would put me to sleep when the visual prodrome occurred (I would go blind about an hour before the migraine began) but it did nothing to fix the cause of the debilitating headaches. After three weeks of chiropractic treatment, my headaches were gone (and to this day, never returned). Thus began my journey to pursue a career in chiropractic, to help others as I had been helped. And I did, for over eight years…until an injury forced my hand (no pun intended) and despite efforts to remain in practice, I was physically unable to continue (I still have my collection of over 20 custom orthoses designed to try to allow me to continue practicing—though none worked). I was forced to retire. Like David Wright. David performed on the world stage and I did not, but we both had very successful careers in our chosen profession—and both had them taken from us, against our wishes, due to injury. Like David, I was in my mid-30s, an entire life ahead of me. I was beyond fortunate to have had a second love to fall back on—writing novels—and I can only hope that David finds his next love in which to spend the bulk of his life working. 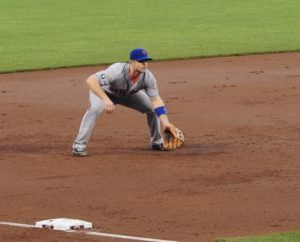 I don’t think much of Mayor DeBlasio (in all fairness, he had an impossible act to follow), but today he named September 29 David Wright Day. For all New Yorkers and fans of honesty, professionalism, and commitment, that’s one thing the mayor got Wright.